As many librarians can attest, people love the library. In fact, you’d be hardpressed to find someone who didn’t believe public libraries are a necessary fixture in every community. But as much as people might cherish the library . . . getting them to engage with it is an entirely different story. That’s why social media can be a key tool for libraries: it offers an easy way for the community to engage with the library, it educates patrons, and it keeps the library top-of-mind. 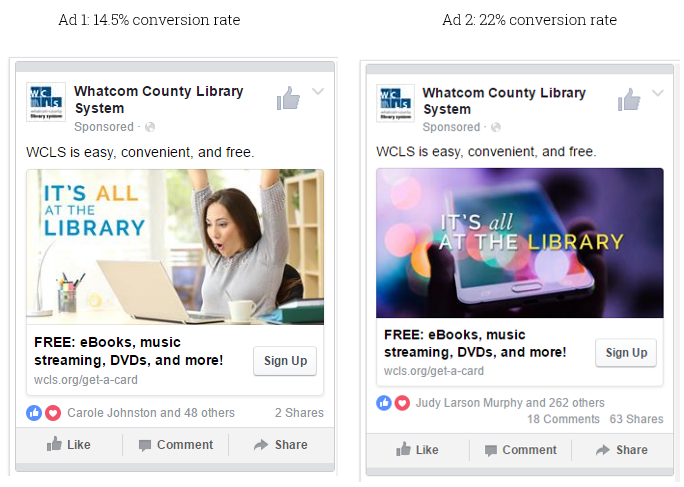 Aggregate library content to see what works best: this is one of ActionSprout’s most helpful tools; instead of manually searching and analyzing individual library Facebook pages, ActionSprout pulls together top Facebook posts within a vertical (i.e. libraries), so you can see what posts are most effective. Within the platform’s dashboard, you can see posts across hundreds of public libraries; you can also share and see each post’s analytics. ActionSprout also offers easy-to-use “social actions” such as, adding a logo to your Facebook profile image, signing a petition, taking a poll, donating, answering a question, etc. The beauty of these actions is they seamlessly integrate with Facebook; when someone takes an action, they’re asked to share their activity on Facebook. Likewise, each action comes with a custom landing page that pulls in and displays social media comments. When someone participates, ActionSprout also automatically captures that person’s email address (even without them entering it), so you can market to them afterwards. 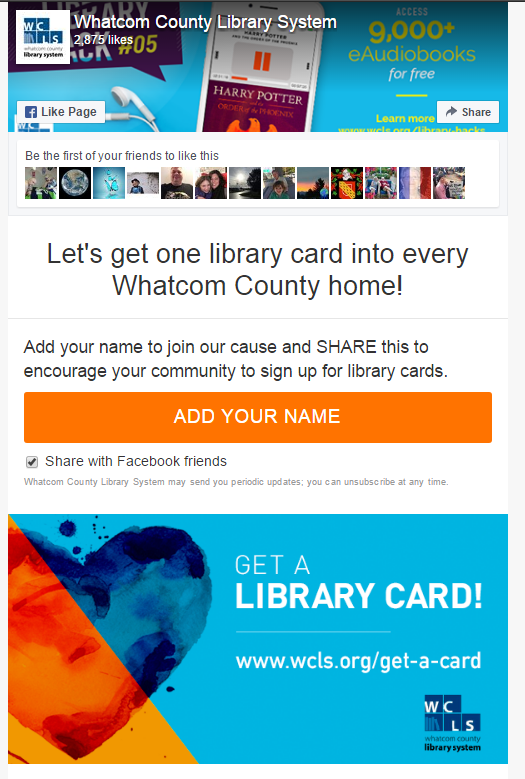 We used ActionSprout to create an online pledge to get at least one library card into every Whatcom County home. The campaign was positive, easy to participate in, and generated a significant amount of positive online engagement with the library. In fact, the pledge was shared nearly 900 times and generated about 40 positive comments on the landing page. Testing your Facebook ads is integral to getting the most bang for your buck–by optimizing your ads, you can see what imagery, copy, and call-to-action get the highest conversions, for the lowest price. Unfortunately, testing Facebook ads is a ginormous pain. To do it effectively, you have to create multiple ad sets and ad campaigns, and then create each individual ad you want to test. This can take hours to accomplish and leaves a lot of room for error. This is why we love (like, really love) AdEspresso. AdEspresso allows you to test up to 100 different ad variations at a time, so you can test and optimize your ad spend money. Just enter in all copy, links, videos, and graphics you’d like to use, and AdEspresso will automatically create every possible ad variation and test them at once. You can pause ineffective ads at any time, add more money to successful ads, and get objective and easy-to-understand data on what’s working and what’s not. Here’s an example of a recent ad test, in which we compared two different images. While the copy stayed the same, switching out the image made a massive improvement. For ad 1, we featured a person making an excited face (this has worked really well in the past in garnering engagement); in ad 2, we featured a “beauty shot,” designed to attract our target audience. Even though the copy is the same, the “beauty shot” ad had a conversion rate of 22%, while the excited person only had a 14% conversion rate—that means ad 2 converted 57% more people than ad 1. With this in mind, we’d highly suggest using AdEspresso if you’re going to advertise on Facebook—it’s an affordable, yet highly effective tool that will save you time, money, and stress in the long-run. 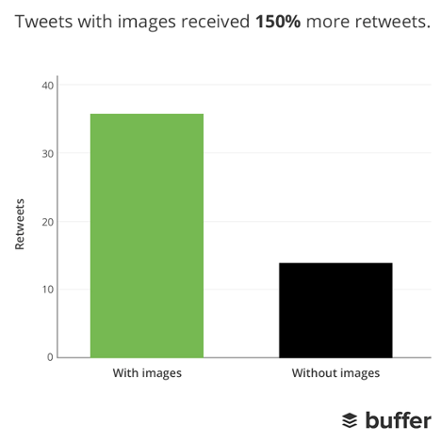 Articles with an image every 75-100 words received double the social media shares as articles with fewer images. In a nutshell, visuals are incredibly effective at engaging your audience. The trouble is, not everyone has the time or staffing to create professional-looking graphics. Not to fear! 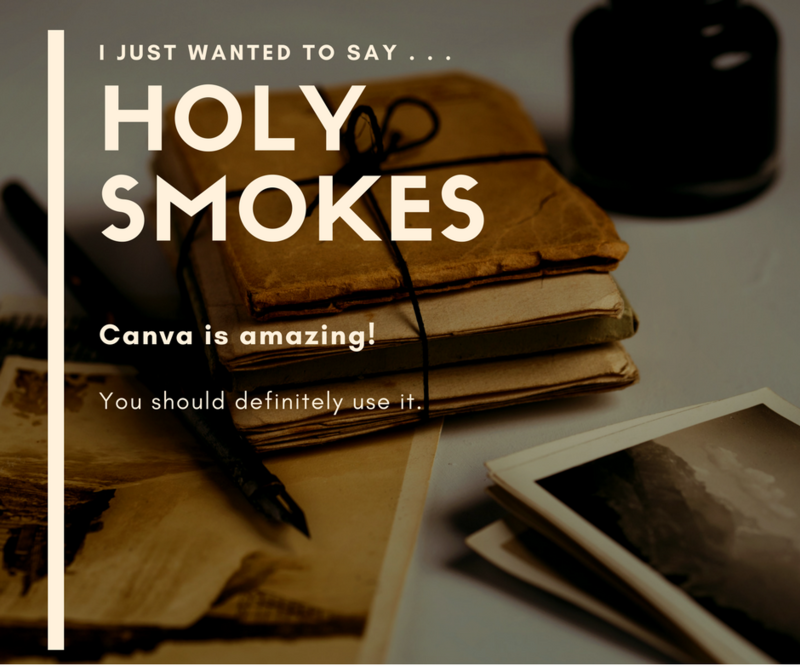 Canva, an easy-to-use graphic design platform, allows you to create impressive social media graphics in minutes. The platform, which is free to use, comes with thousands of stock photos, pre-sized templates, beautiful typography, graphics, icons, and more. In short, adding a simple visual to your social media posts can significantly increase engagement and boost overall library engagement. There you have it! These three simple tools can help you curate content, optimize your ads, and increase engagement with beautiful visuals. If you don’t have the time or resources to manage your marketing on your own, we’re here to help! Contact us at sherri@redrokk.com or (360) 747-7401.